Laminated Tube Filling Machine with Sealing, Cutting and Batch Coding. Our range of Laminated Tube Filling Machines has a syringe pump housing and rotary piston filling device that has a blow-off device pneumatic tail cut-off system. 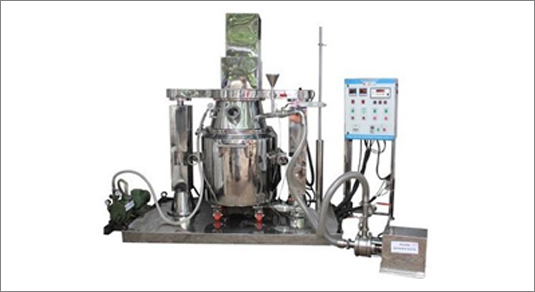 These machines have a high filling speed of 40 to 50 tubes per minutes and jacketed hopper single head type of capacity of 40 litres. 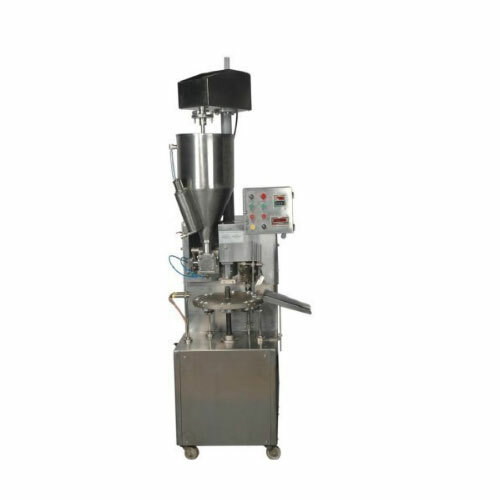 These tube filling machines are provided with stainless steel spring loaded change part 12 nos. nylon holders one tube size. These machines are also equipped with temperature controller with 3 KW SS tubular heater. 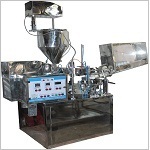 Our range of machines have a label sensor and controller and various optional accessories like vacuum cleaning jacketed hopper with stirrer, product level sensor in filling the hopper with pump controller, automatic cassette loader to load the tubes and orientation sensors with a stepper motor. 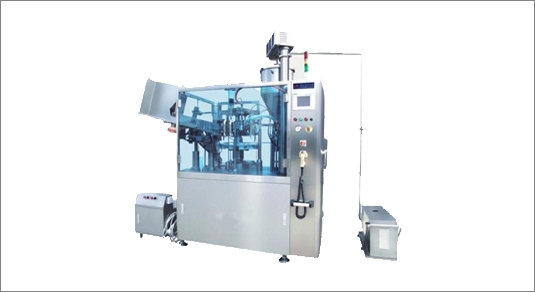 A Fully Automatic Lami/Plastic Tube Filling machine, with have high operating speed and 12 Stations compact rotar. These machines are no tube - no fill device, with a bottom up filling system and filling accuracy +/ - 0.1%. The tube holding Cup is manufactured using quality stainless steel of grade 304. 8. Manifold cam indexing device Make Camfield. Belt Less Stirrer Device with augur to keep the product in Continuous homogeneous condition. 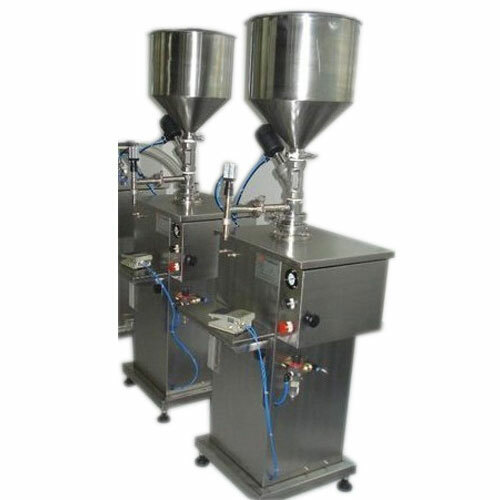 Filling Station: These machines consist of a hopper of capacity 40kg. with cut off valve that is connected to the filling cylinder which also has a capacity adjusting arrangement. The delivery nozzle is provided with special pneumatic cut off the system to prevent dripping. Sealing System: This system comprises of a preheating station and a sealing station. Heating Station: This station is compressed with hot air is blown to preheat the sealing area. The compressor air is then heated in a chamber that is fitted with a hot air tool leister. The Pneumatic regulator is provided to control the air pressure and a temperature controller to control the heat. Sealing Station : This station is pneumatically operated and special jaws seal the tube. Batch coding is done at this station. Trimming Station: The uneven end is trimmed at this station. Batch-Coding Station :Batch coding is provided at the Sealing station. Electrical: The machine is fitted with 1 Hp motor that is 1440 rpm Hindustan make along with 30:1 ratio gearbox, electrical panel box and a no tube, no fill process are also provided. Note: An air compressor of 3Hp is required. Aluminum Tube Filling Machine/Aluminum Tube filling Crimping, & Batch-coding Machine is sturdy and compact in design and is simple to operate. Fitted with a non-return valve below the Stainless Steel main filling block, these machines consists of an aluminium-rotating disc that has an interchangeable tube holding sockets for different tube sizes. The 1st and 2nd station are for the feeding of tubes, the 3rd Station is for Vacuum Cleaning and the 4th Station Empty. We offer superior quality Cream Filling and Ointment filling machines that are manufactured using a medical grade of steel and designed to perfection. These machines have semi-automatic piston type rational in design and are small & exquisite in the model. The pneumatic part of the machine adopts the pneumatic components of Germany FESTO and Taiwan Airtac. Our range of cream and ointment filling machines are renowned to provide hassle-free performance in cost-effective operations.